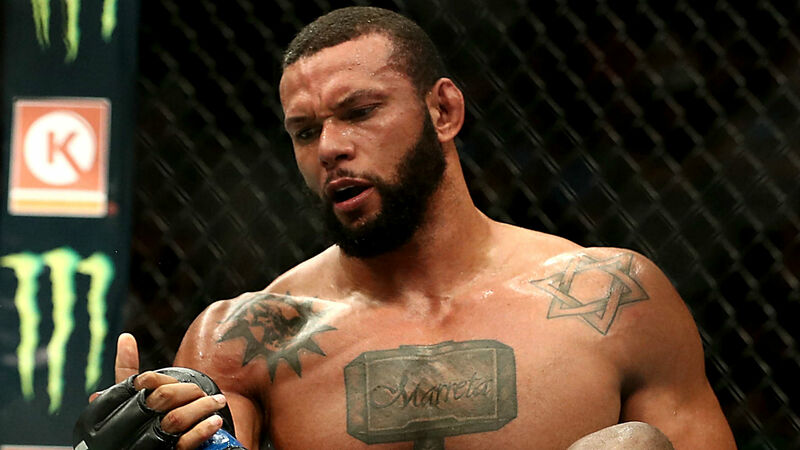 Thiago Santos could have refused to face Eryk Anders in Saturday’s main event of UFC Sao Paulo when Jimi Manuwa pulled out last Sunday because of a hamstring injury. No one would have blamed him if he did. Santos loves to fight, though, and so he took on Anders, eventually winning by TKO when Anders couldn’t come out for the fourth round. Anders began the fight looking to be aggressive and hunt down Santos. He then reversed course and began working the clinch to get Santos against the cage, wear him down and combat Santos’ lethal striking prowess. Santos continued to escape and unload heavy shots, however. Both fighters came out firing to start the second round. Anders secured a takedown but Santos quickly got back to his feet. Anders dared Santos to come to the ground and the Brazilian had no problem taking him up on the offer; there, he delivered a series of ground-and-pound punches. That changed Santos’ mindset as he got back to his feet. He became looser with his strikes, landing the harder shots. Near the end of the round, Anders scored a takedown to perhaps change the fight. Anders started the third round with a takedown. He took Santos’ back and looked for a submission. Santos landed heavy shots to break free and get the fight back to the standing position. From there he immediately unloaded a barrage of left uppercuts. Focused on winning the fight, he tried to get Santos down once again. While Anders stalled in the position, Santos battered Anders with a series of vicious elbows and punches to Anders’ head. It appeared Anders would make it out of the round. He tried to walk back to his corner, but he collapsed twice to the mat and referee Marc Goddard waved off the bout. Santos (19-6) has won back-to-back outings and six of his last seven. Anders (11-2) has lost two of his last three.